Entirely built with web technologies, SOLVNet, the B&B Market SFA ANALYTICS CRM solution offers a great flexibility by offering all its functionalities both online and offline. 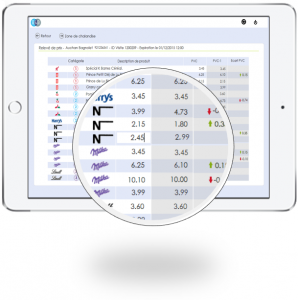 B&B Market just enriched its SOLVNet platform with a completely mobile in store price recording solution, compatible with both Android tablets & iPads. The price quoting solution offers Simplicity, a “Waouh!” effect on clients and data synchronization with SOLVNet server. No installation is required because our solution use the user’s tablet’s cache. In fact, the user only needs to connect to SOLVNet servers to be able to download the app and use it on cache. The cache contain temporary data automatically stocked. This allows for a faster and smoother, just like a memory. The app offer a unique space where you can find all the necessary information to do an easy and efficient store visit. Salesman can work in total freedom, online or offline depending on the situation. The connectivity is simplified and automatic. The nomad sales force benefits from an homogeneous integration and a unchanged user experience on all SOLVNet system may they be connected or disconnected. Client satisfaction and profitability are the keywords of our mobile offer. Our solutions allow a better business flexibility while enhancing your sales force by improving its productivity. If you want further information about our mobile offer, don’t hesitate to contact us.